1. Place chicken between 2 sheets of plastic wrap; pound to an even thickness using a meat mallet or small heavy skillet. Sprinkle chicken evenly with salt and pepper. Place flour in a shallow dish; dredge chicken in flour. 2. Melt butter in a large nonstick skillet over medium-high heat. Add chicken to pan; cook 3 minutes. Turn chicken over. 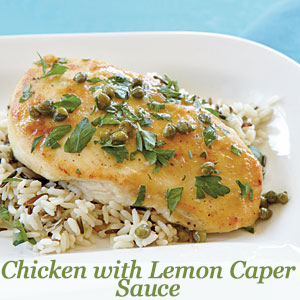 Add broth, juice, and capers; reduce heat to medium, and simmer 3 minutes, basting chicken occasionally with sauce. Sprinkle with parsley; cook 1 minute. Remove chicken from pan; keep warm. 3. Bring sauce to a boil; cook 2 minutes or until thick. Serve over chicken.